We decided to get out of town and head west for my Birthday. This trip was one of the best trips we've ever taken and one of the best birthdays I've ever had. In true Bravenec style, we did not plan ahead, however we managed to see just about everything West Texas had to offer. 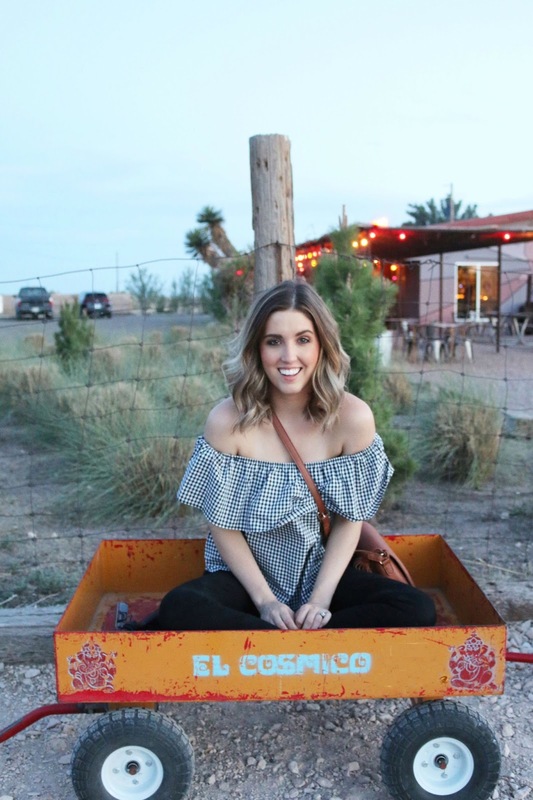 We stayed in at El Cosmico in a Airstream trailer, it was incredible. The trailer had a kitchen, bedroom with a full size bed, indoor bathroom and an attached outdoor shower. Plenty of space to lounge and store your belongings. Although, I would suggest you bring an iron or steamer and a hairdryer. Additionally, it was really hot during the day, but cooled off quiet a bit at night. If you're wondering, I packed layers and a light jacket! The hotel has a main lobby where you can buy beer and a few snacks, however if you want to save some money I would suggest going to the local grocery store for drinks and such. The campsite was quiet and peaceful our entire trip and there were white tailed bunnies that roam around the campsite, it's beyond adorable. 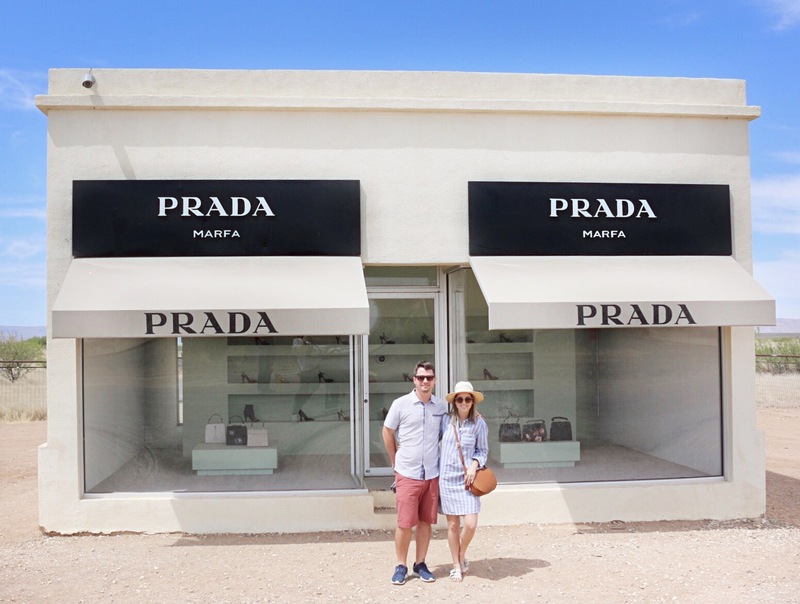 I would highly recommend visiting the the Marfa Lights observatory, the pool at the Hotel St. George and driving out to see the Prada Exhibit. I loved every bit of our stay in Marfa. Marfa Burrito, best breakfast burrito hands down. Food Shark, get the Marfalafel! For my birthday we had drinks and dinner at La Ventura located inside Hotel St. George. The NY Strip is massive. Trust me, you don't need an appetizer! The drinks were fun and the staff was wonderful. Next stop, Plaine Ice Cream + Coffee. Get the nitro brewed coffee, sounds extreme but it was amazing. I've actually craved it ever since! There's not many restaurant options in Alpine, but El Patio had delicious enchiladas and speedy service! Be prepared, the water was cold, but refreshing and there was an abundance of pupfish. The pupfish are harmless and kind of cute! The park has a concession stand and a place to change into your swimsuit! If you're wanting to camp in the Chisos Basin, you'll need to reserve your campsite at least 6 months in advance. The high demand for this campsite is understandable as the the basin is beautiful. We decided to hike the Lost Mind Trail. It took us 4 hours to hike the entire trail, about two hours up and two hours down. I would suggest starting early in the morning; wear LOTS of sunblock, a hat, hiking boots and drink lots of water. Bravenec surprised me with a three hour horseback ride at Big Bend Stables. I rode a horse named Luna, She was the sweetest horse. Bravenec rode Sleepy-Joe, the most laid-back horse to ever exist. I loved every second of our three hour ride and I will never forget this experience. The view from the trail was so pretty and we got to experience a completely different side of the park. There's not much to do in Terlingua, but you have to have a beer on the porch at the Starlight Theater. We stayed at Lajutas golf resort http://www.lajitasgolfresort.com. The resort itself was really pretty and the golf course looked immaculate. If we had stayed a second night I know Bravenec would have played a round.